Spring in Long Island North Fork Wine Country happens to be the perfect time of year for a romantic getaway. After a long winter of being inside, those first few glorious weeks of spring are just perfect for getting out and enjoying nature and the countryside. 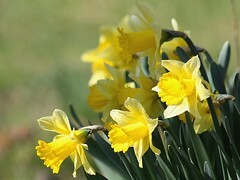 The excitement mounts as the daffodils and tulips bloom and the gardens stir after a winter’s rest. The grass is now green and the leaves are ready to pop open on the trees. This is truly a refreshing time of the year and is Mother Nature’s rebirth of nature. Birds that migrated for the winter are back and their excitement can be heard in the early mornings. It sounds as if they are as happy as the rest of us that spring on Long Island has returned and summer is just around the corner. The once vacant beaches are now awaking with activity as couples stroll hand in hand enjoying the feel of sunshine on their faces and the mesmerizing sound of the ocean as waves break at their feet. Elaborate plans are not needed to enjoy spring on Long Island. It just happens! This entry was posted on Friday, April 23rd, 2010 at 6:29 am	and is filed under Long Island Things to Do. You can follow any responses to this entry through the RSS 2.0 feed. Both comments and pings are currently closed.